Solar powered residents share their experience and enthusiasm in Lido Beach this weekend by showing you how solar works for them, and how it could work for you. 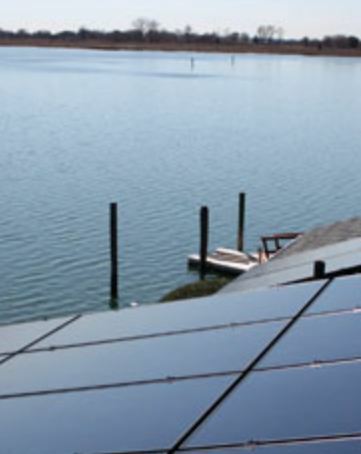 Open to residents from Lido Beach, Point Lookout, Long Beach, Atlantic Beach, and Island Park, EmPower Solar has arranged this special tour so people can see solar energy in action. I had attended this about three years ago and it was very cool. So if you’re even remotely into or interested in renewable energy or solar power, by all means, check it out. You must register to receive locations. with your name, phone number, and the number of people attending. EmPower will reply with the list of homes on this years tour. I did grab this picture at high tide on Thursday. 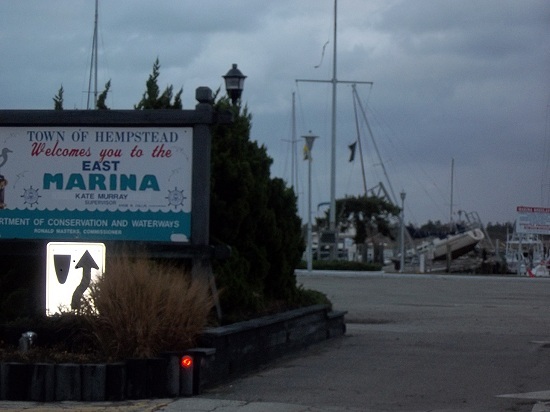 The bay was about 6 inches below the bulkhead at the Point Lookout East Marina. We lived! 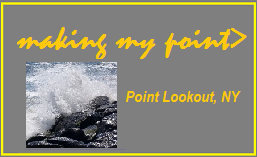 Best I can tell (please correct me if I’m wrong) there was no flooding in Point Lookout, Lido Beach, Island Park or Long Beach. I guess we need more than 4 ft above astronomical high tide to do that. 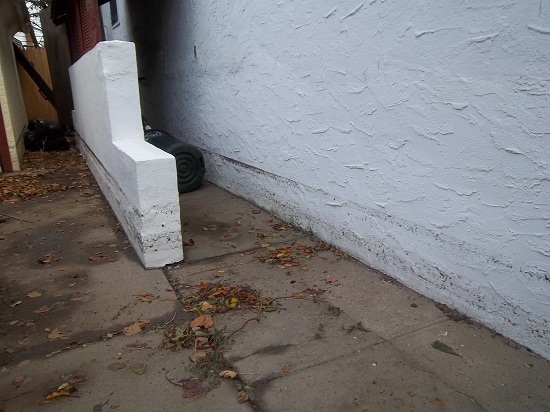 I have heard reports of flooding on Lawson Blvd in Oceanside overnight Friday night March 8, 2013. I think that once that 5 ft above high tide happens, it’s probably quickly downhill from there, as you can see from this picture, taken at around 3.5-4 feet above. I’m a big weather report skeptic, but after Sandy it’s better to stay calm but be aware of the potential risks. I have to say, It’s pretty hard to update you all in this non-fluid format. – as we saw on Thursday PM. No sooner had I updated that everything was fine, then literally 5 minutes later the coastal flood warnings came in. I feel obligated to share this weather information so people have more access to actual reports, Instead of just hyped up nonsense. I do realize, at the same time, I am obligated to remind everyone to stay safe rather than sorry. what did you see? how did the beach make out? We did plan that if things were looking like they would be bad on Monday, we would evacuate to family in Valley Stream. After the 3PM declaration of Mandatory Evacuation, we decided in light of the total lack of, conflicting and the lack of believable information, to just head out for higher ground. “I hear they’re closing down the Loop Parkway as of 4PM so you have to get out now” (turned out to be true. 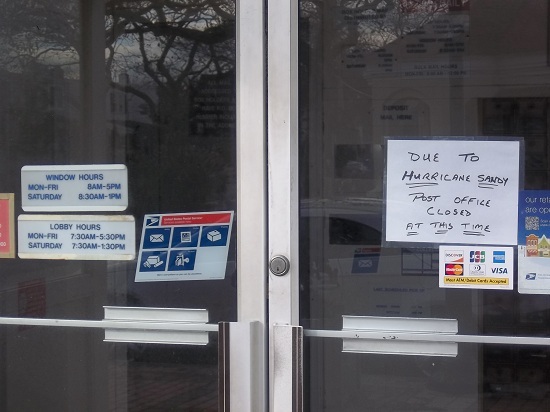 CBS News was reporting that, but they failed to mention it was only In To Town, you can still leave). “yeah, I hear they’re closing Atlantic Beach Bridge this evening, too” also turned out to be true, once again only to traffic to Atlantic Beach, not the mainland. I headed down to Bob’s Natural Foods for some other items and saw stores boarding up and sand bagging. Was wondering what they knew that I didn’t. I mean 12 guys out front of the new stores by Don Juan. Well, every one knows the Long Beach Bridge floods before those others. We made emergency packing a priority got some bags together got the cooler out, and to ready to leave. “Surprise” I told my family in Valley Stream, “we’ll be there in a couple of hours”. Hunkered down in Valley Stream for the day. By Noon, it seemed like an average rain and windstorm and I did manage to get that last post out with all intents of updating as the day went on. Sandy had different ideas and we lost power and internet by about 2PM. So much for the update. Everyone has his or her stories of the storm. We were worried about the 100+ ft. trees surrounding us, but made it through with no real damage and no craziness. By midnight, the gusts were done. Those who stayed said that power went out about 6PM. During the high tide, at about 8PM, the bay was rising up into town, foot by foot. It had backed up over most streets north of Lido Blvd, with Mineola and Lynbrook worst hit, but did make its way up past Lido Blvd towards Beech. Hewlett Ave going from Beech went from mostly dry to 6 inches, to about 12-15 inches above the street at Lido Blvd. It lasted for about 1-2 hours then receded. Sandcastle Café report that somehow they had no flooding. others were not so lucky. Well, there’s no clear evidence of such a thing, but correct me if you have other info. The Ocean definitely was into Ocean Ave, but it does not seem to have been extensive, far-reaching, or deep. 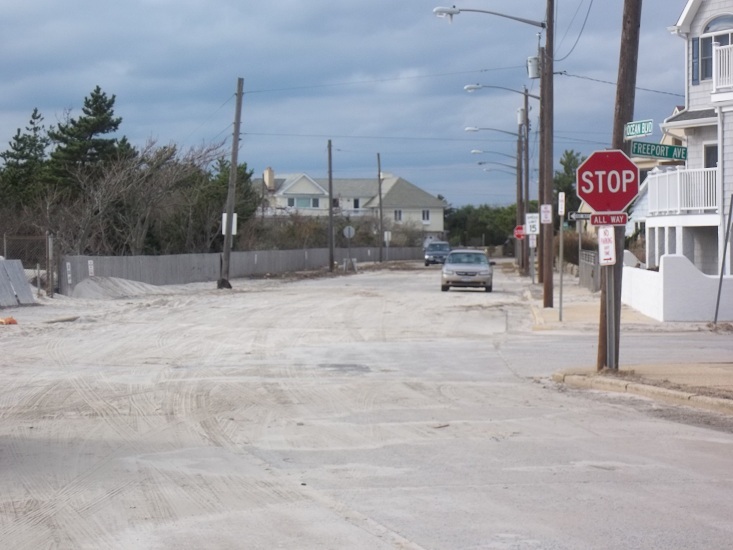 It is pretty clear the dunes saved us…at their expense. 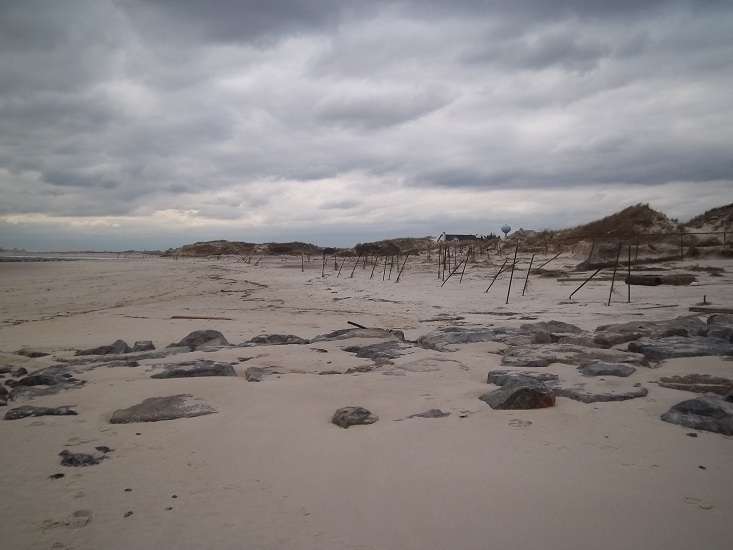 Point Lookout and Hurricane Sandy Day 3 (Tuesday). With no power we made the best of the day inValley . Our neighbor who lives in manhattan was one of several who (finally) got a call thru to us to see if we knew anything. He was going to try to get out and see what was going on. We agreed to touch base later. 2) Meadowbrook parkway closed south of Merrick Rd. 3) That fine young journalist lady on the local news who was holed up in the Allegria talking the way she did during Irene. I’ll never forget the “live” shot of her struggling in the wind, with onlookers looking at her like she was crazy as they strolled by. No doubt, for me, the media Crying Wolf of the past 10-12 years of storms that fizzled out hurt me this time. With that, we stopped waiting and headed home. Turns out the State troopers are letting residents back into town. Coming over the bridge, we found a weird scene. The wind turbine is stopped, but seemingly undamaged(as expected). It’s once again stopped because the power is out, not the other way around. The marina looks like toy boats got knocked around. 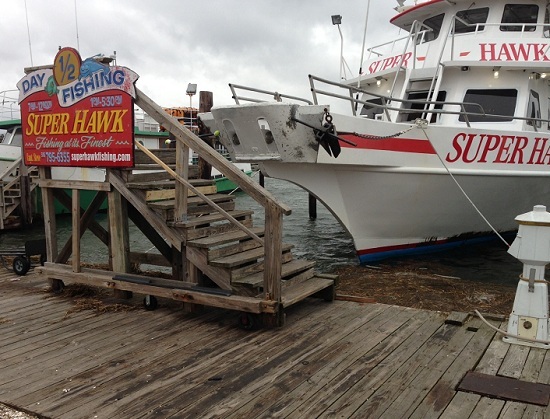 The water put a few up on the dock itself. Other areas of dock are smashed or gone. It looks bad, but could’ve been worse. Coming into town, to the naked eye, we found little damage, but the bay had receeded. Right there at the marina, the fence it full of bay reeds and leaves that strained through the chain link, showing a real clear picture where the water had been up to-about 3-4 feet higher than Lido Blvd right there. * No Power- ive seen at least 2 power lines down plus numerous others that may or may not be electric. * cellular reception. VERY VERY bad to none- you may need to leave town to get a call in or out. We had water right through our garage, but the house is OK. We have a crawl space, so no flooded basement. Don’t know how you all keep doing the basement thing. The water did cover our pond, killing all the fish we have had for 10-12 years in their own, self-sustaining little ecosystem that required no feeding or new fish- all gone. Poor little guys. 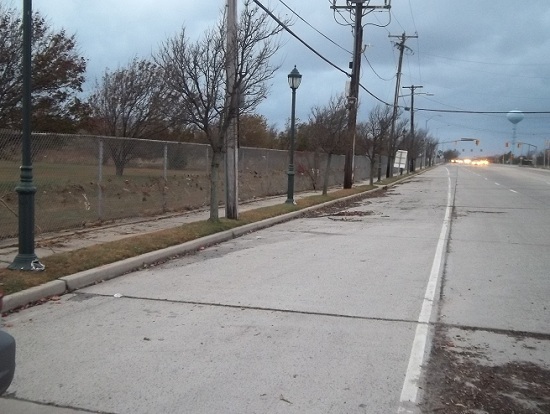 Driving to LB, we could see the high water mark on the fences by the TOH Park at about 4 feet above the sidewalk. thru LB, Park ave had signs of being washed out, cars set askew (by floating?- some by moving onto higher ground of the median). The Mobil gas station has a 6 inch puddle of sea water in the entire gas area. Signs of major flooding into island park, especially at the bridge into Harbor Isle. Over the bridge looks like a parking lot-on a street no houses front on. Everone moved their cars here, we find out only to be flooded anyway. Family OK, no power like everywhere else. No one can believe the water came up here. Headed back thru side streets in north east LB, I can see the damage: I see high water marks on houses about 4-5 ft above street level-whether that falls on your first or gound floor depends. My wife sees a young woman carrying garbage bags of belongings, tears streaming down her face. Haven’t heard back from the long Beach crew yet, but the phone is not really working so good. We get home-tomorrow we have to start the clean out. 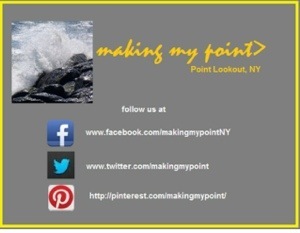 Point Lookout and Hurricane Sandy Day 4 (Wednesday). Spent all day cleaning out the garage and yard. Not too much damage surprisingly, but everythings gotta air out or we’re gonna have a moldy mess. the chair hut is washed up with the sand that used to be the dunes. My wife’s garden is gone, that’s saying a lot. She spent the day cleaning it out, cutting down and making the best of it you can without using our water to wash things down, which is currently prohibited. We’re abiding by that because it’s the right thing to do. 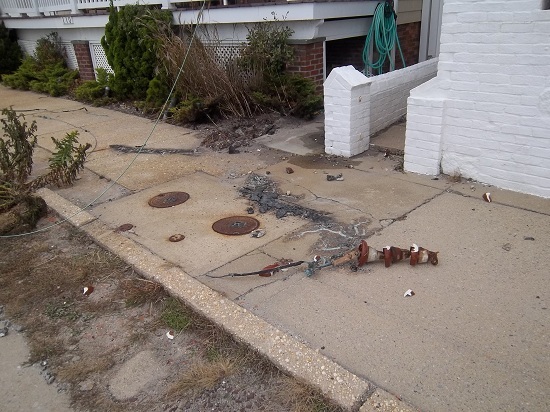 All the plants and the trees in the street are looking pretty sad from the salt water wash.
About noon, word came down the block National Grid are shutting down Gas to entire section of town from Lido Blvd to the Bay because of several gas leaks. Got out to survey town. Some crazy pictures here. 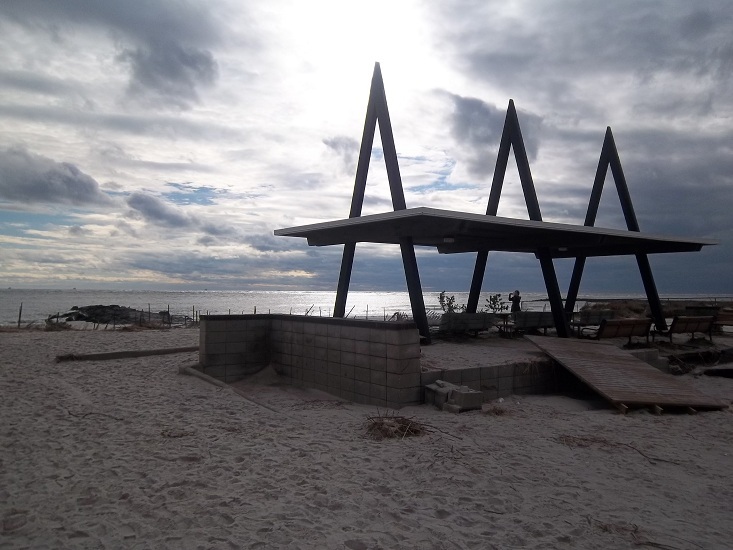 Point Lookout and Hurricane Sandy Day 5 (Thursday). We’ve left town to try to get gas today, evacuate our inlaws out of Island Park -also very hard hit- to family with power and heat. Tried to get gas just way too crazy-half hour at te end of a mile longline that didn’t move for a half hour-people freaking out got the heck outta there. Taking a couple hours at family in Glen Oaks Queens where they’ve got heat, hot water, power ineternet(obviously) and headed back to the Point tonight. Hope everyone’s ok. Its gonna be a long week or so. We got hit pretty hard. Lido is bad, Island park is really bad, and what I’ve seen of Long Beach is worse. Don’t know about Atlantic Beach. would think very bad. feel free to check into our facebook page and leave a message! what was your experience? what happened for you? leave your comments here. Latest National Hurricane Center Storm Surge Probabilities numbers indicate 50% chance of 5-6 foot storm surge for Point Lookout / Long Beach / Lido Beach / Atlantic Beach for Monday. East & West Bridges are open to get out at this time, however the LB Bridge is currently closed. i take this to mean as we said yesterday was most likely, there was flooding on the Island Park side by Starbucks? anyone know? i would imagine this means we should expect flooding again, most likely much worse at this eveinings next high tide(beginning probably HOURS BEFORE it). 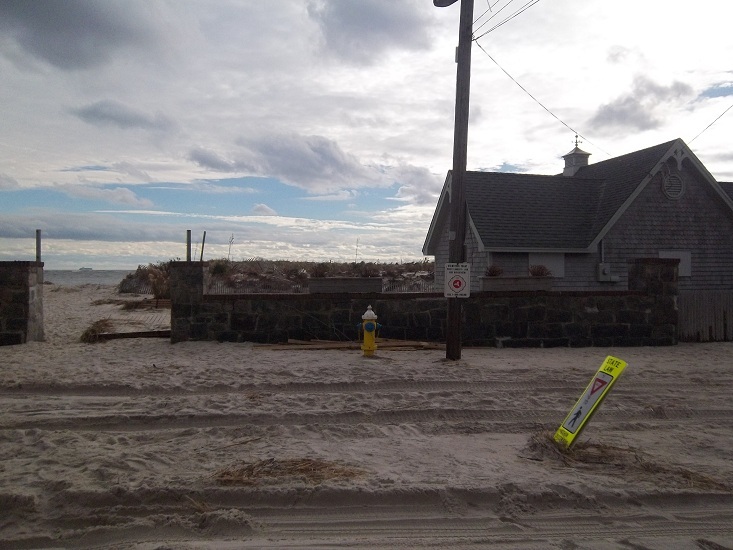 there are some real flooding in other towns from last high tide- east rockaway, bellmore i kniow of. how are you? as the storm tracks much farther south than the local sky-is-falling “news” outlets are still talking (but never showing), in fact their coverage is going with even crazier hype-up talk this morning. did you stay or have you evacuated? any pictures, let us know. Loop Parkway bridge closed BEACHBOUND at 4pm today. YOU CAN STILL EVACUATE VIA THIS OFFICIALLY DESIGNATED COASTAL EVACUATION ROUTE! another of the media’s freak out half-information reports saying the road would be closed (CBS RADIO). Sarah J. Meyland from NYIT presents “What You Should Know About the Lloyd Aquifer”. “This is the most serious problem in the city’s history”- Harvey Weisenberg, Long Beach, NY State Assemblyman. After 23 years in the state assembly, 2 terms as Long Beach City Council President, 20 years teaching, and living in the area for 50+ years, that’s quite a number of other problems to comapre to. He said he’s committed to working on the problem and his track record of commitment to, and delivering on our local issues is well known. 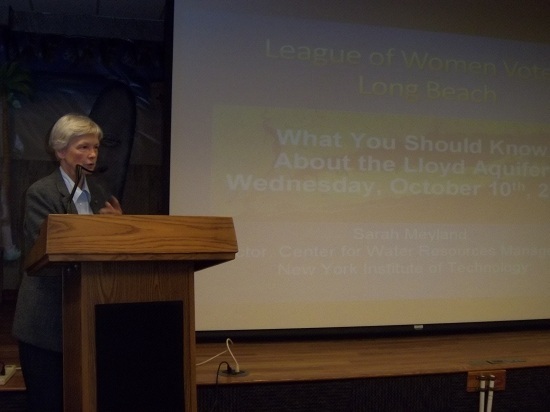 In an evening at the Long Beach Public Library brought to us by the League of Women Voters of Long Beach, Sarah J. Meyland, Director at NYIT (New York Institute of Technology) Center for Water Resource Management gave a cool, level headed, extremely informative presentation about our drinking water. Easy for her to be calm- she doesnt live here, but she says the people that live here should be very concerned about the seriousness of the situation. It’s very difficult to disagree. We need a solution to protect and preserve our drinking water. Latest test results show serious danger signs. Many are not aware-we are already on our last resort water source here on Long Beach Barrier Island. NYS Assemblyman Harvey Weisenberg spoke briefly: saying “it’s the biggest problem the city has ever faced” may say it all. So what has happened? The news isn’t pretty! Long Beach and Atlantic Beach test wells show potential saltwater intrusion may be underway into Lloyd Aquifer -our “sole water resource” (that means THE ONLY PLACE WE CAN GET OUR DRINKING WATER), right below us at about 1500 feet down. That would be a “game over” for drinking water here on the barrier beach. There are no water pipelines from anywhere to here, no way to start cisterns and other catchment because a few feet down in our ground is salt water, so there’s nowhere to store catchment. This may mean that salt water is forming a plume into the fresh water, centered on central Long Beach. Although drinking water standards are 250 ppm, any increase is a major warning because intrusions are not gradual. The seperation between where it is all fresh water and where that becomes all salt water is very thin. There is no wide area where salt to fresh water ratios go up gradually. If you start seeing higher numbers, YOU ARE VERY LIKELY IN THE INTRUSION NOW. The problem is: Pumping too much water without replenishment will cause a draw of salt water inland, eventually past the point from where we can pump our drinking water. 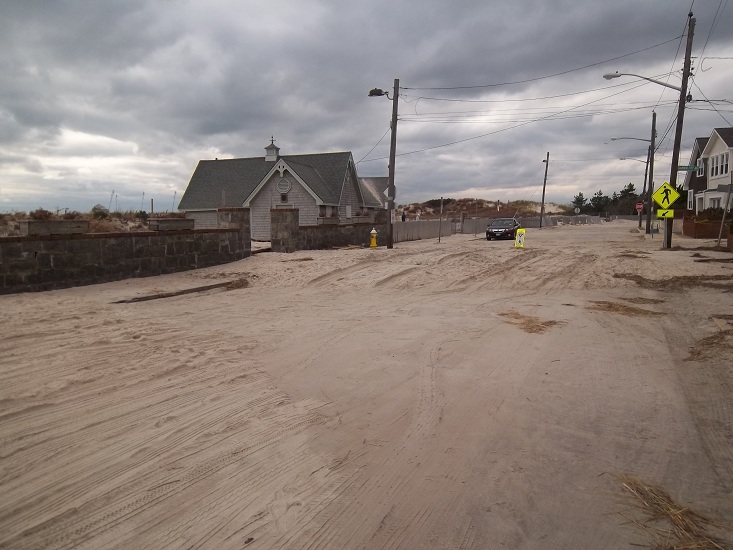 LONG BEACH ISLAND RESIDENTS From Atlantic Beach, Long Beach, Lido Beach, and Point Lookout Need to take action NOW! Call and ask your Long Beach, Town of Hempstead, Nassau, and New York state representatives to get involved. guess what… no one’s in charge of managing the aquifer resources. whoever pumps, gets. thats the job the water companies are supposed to do- they are not responsible for monitoring, conservation, management, protection…Nothing! 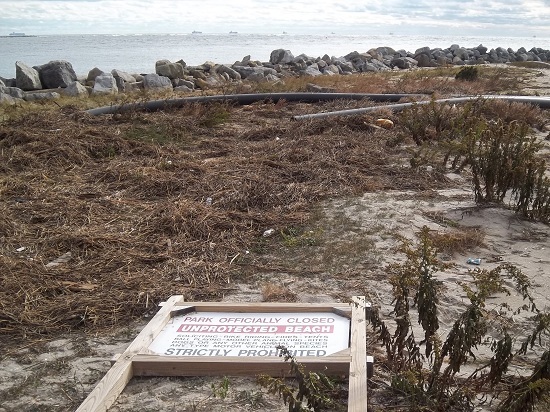 Although they do realize that these are in their best interests, and they have put up the money Nassau County rescinded for these purposes…for 2012 year only, and thousands of dollars short-but hey-it’s not their job the way the laws stand, so we need to get together with them, too. and no one still does to this day. No one even knows how much is safe to be pumping out, although by old Nassau County Estimates, we are at least 25-30% above previously discussed “safe” levels. What is safe to say is that if we are pumping out 9% of all the water on Long Island, but the aquifer only gets 3% of the recharge water, we are beyond sustainability. The aquifer is going to absorb from where it’s easiest, and that’s the heavier salt water pushing in, not the filtered recharge that should be coming from rainwater above. Like to get fresh water at your house? Then YOUR involvement will be needed. If you were at this meeting, please contact us. Coming soon, we will be posting a litttle more on the science involved to help get the word out so everyone can act with the most accurate information and understanding of the situation. Please take a minute to share this information on any of the buttons below with everyone you know, especially on the South Shore. Other water districts in between are or will be impacted too, and it’s being decided on that NYC will also be tapping our water resources again -that’s you Valley Stream etc. !